If you have a question that isn't answered below, or if you require further information please don't hesitate to contact us online or call our team on 01376 310 510. Will DealerWorks work on my computer? DealerWorks can be used on any PC or Mac that has an Internet connection and a modern, standard compliant web browser installed. DealerWorks is an online software application that powers your website, and is provided as a service (SaaS). This means there is no installation needed and your computer does not need to be online all the time. I list my cars on other platforms too, can I still use DealerWorks? Yes, the great thing about a DealerWorks site is it's independent from any other advertising platform. You can list stock on your website that you don't wish to list (and pay for) on other channels. Will I be able to use the vehicle updating system without much computer experience? Yes! DealerWorks was built to be easy to use. Every menu is clear and does exactly what it says. We also offer free telephone support if you do get stuck and need some help. Yes! Your site comes complete with 12 months of hosting, which covers 1GB of monthly traffic and 100MB of web space, plus 5 POP3 email accounts (name@example.co.uk). The renewal fee is just £269+VAT per year, which works out at about 27p per day! Continued hosting from us is required to keep your site online, the website is powered by our specially made DealerWorks website software which is only available on our servers. FTP or source files are not provided - all changes are done via the easy to use control panel. 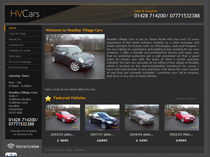 I wish to use DealerWorks, however I require a more advanced website, is this possible? Of course! We can also provide custom packages for larger, more advanced sites with more features, please call us to discuss your requirements. Basic training is included to get you started and our team will run you through adding a vehicle and updating a page over the phone during the site hand over to make sure you're setup and ready to go. It's very easy, the whole system has been designed to be easy to use for all our customers. You don't need to be an expert to use it. Help! How can I get support? Our office is open Monday - Friday, 9.00am - 5.00pm, feel free to call if you need help. As DealerWorks is an online system, most support queries are usually forgotten passwords or usernames, so make sure to keep yours safe. What makes DealerWorks different compared to other site packages? 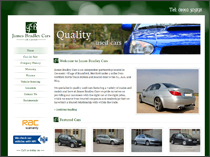 DealerWorks is unique because each website is professionally designed to suit your needs, complete with logo design, or use of your existing one. All our sites are Search Engine Optimised (SEO), this helps improve rankings on search engines such as Google, therefore increasing hits on your website. There are no limits; you can upload an unlimited number of vehicles and multiple photos for each one (limited only by web space). This package also comes with an extremely user-friendly Content Management System (CMS), which allows you to edit text on any of your pages and add your own new pages created from a skeleton of your site. Overall, giving you complete control over your website at the click of a few buttons, at a very affordable price with minimal on-going cost. For security reasons if you have lost your password please call us on 01376 310 510 and we will arrange for a new one to be sent to you. 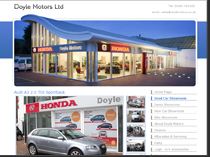 I no longer wish to use DealerWorks, can I move my website? No, it's not possible to relocate your DealerWorks site to another provider. Continued DealerWorks hosting is required to keep your website because it runs on the DealerWorks software - this provides the vehicle stock list and all content within the site. There are no static or other files available so there is nothing to move elsewhere. You do not own any part of the DealerWorks software.